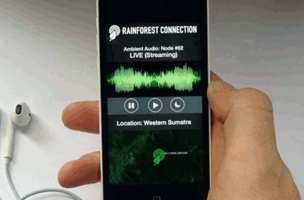 If an endangered tree falls in a forest, you can use an old smartphone to hear it. That’s the goal of this Kickstarter project aiming to protect the earth’s diminishing forests from illegal logging. By using old, unwanted Android smartphones, the tree lovers at Rainforest Connection are hoping to reduce e-waste in order to protect trees. It’s smart and efficient. With real-time audio connections to the world’s endangered forests, each device could eliminate emissions from approximately 3,000 motor vehicles, or 15,000 metric-tons of carbon dioxide. That’s because each device will be able to listen to 300 hectares of forested land. The audio signals captured by the phones will be tracked to listen for chainsaw noises as well as gunshots, indicating logging or even poaching of animals in protected zones. Each device comes with its own solar power panels so they can run indefinitely and you can even hear it. We already know where the illegal logging takes place, so why waste time trying to survey these areas? That’s good news. In such a case, devices installed in that area would still be able to let you know in real-time when it’s taking place. The sensors allow real-time intervention and response, by alerting the authorities. They also create a forensic record of evidence of extraction and the patterns of illegal activity which can be used in many ways, including in a court of law, should the authorities never respond. Knowing where destruction is happening is an asset – knowing where AND when is far better. It empowers people to call first responders (rangers/police) in the same way we might call 911. If the first responders don’t respond, it allows us to show a record of their failure to respond by showing that they were alerted to illegal logging but did show up or did not stop it. If you have an old smartphone, the team will also accept device donations, but they also need your money in order to install it and make it work.